The last available crullants at Semisweet Bakery by 8:10 on Saturday morning. At 7:50 a.m. on Saturday, Robbie Brody and his 8-yo daughter Eve Kim-Brody were first in line for crullants when Semisweet Bakery opened. 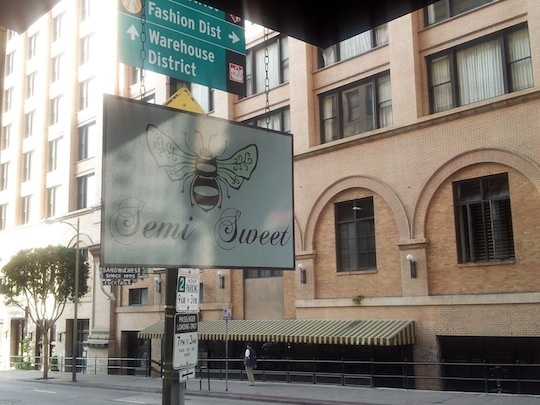 Semisweet Bakery is located in downtown LA near Main and 6th streets. 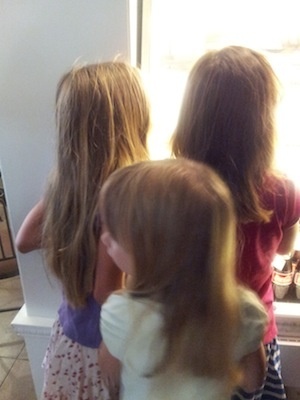 Friends Vivienne Freeman, Clara Freeman, and Adrienne Griffin traveled with their moms from Eagle Rock. 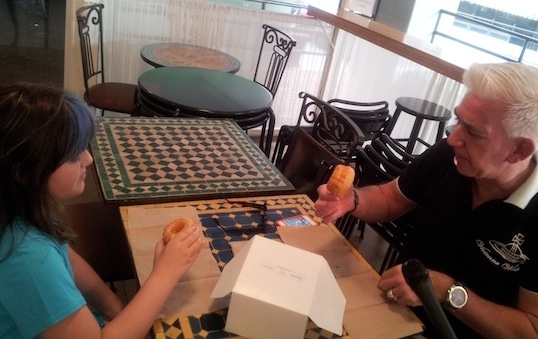 But the adults wanted crullants: the kids were happy with regular doughnuts. 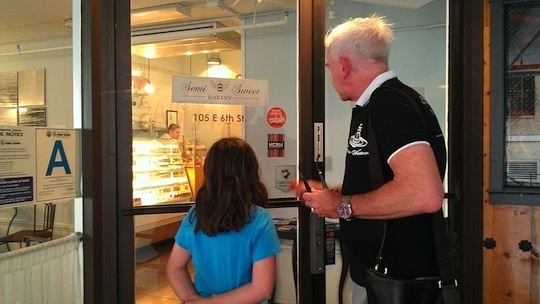 Eve Kim-Brody, 8, and Robbie Brody were the first to try Semisweet Bakery's crullants. If you have friends in New York, you'll know that the city has been going nuts for cronuts, the croissant-doughnut hybrids that debuted last May at the Dominique Ansel bakery in Soho. They're so popular that people are reportedly waiting 2 hours to get their hands on them every day. There's even a black market around cronuts: you can pay one service $70 to wait in line for you, and another will deliver a single cronut right to your door for $100. That's a doughnut with a "hole" lot of hype, which, of course, L.A. wants in on. 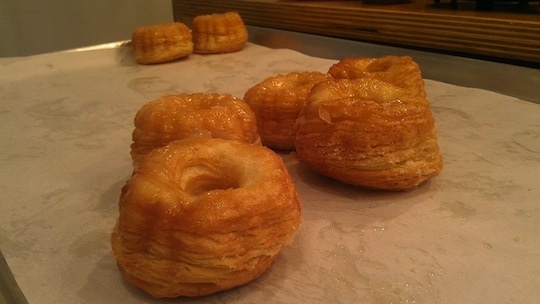 Now, there's a bakery here that's offering its own take on the trademarked "cronut," called a "crullant." Sharlena Fong is the owner of Semisweet Bakery in downtown L.A., and she created the recipe for a crullant from scratch. "I've never actually had the cronut, but I heard about the cronut at Dominique Ansel's in New York and at first I was like, oh, that looks amazing," said Fong. "I didn't really think about making my own for quite some time until the LA Times article that said, hey, LA pastry chefs, come on make a cronut! I thought, I have all the equipment here and I have all the ingredients. Why not start trying?" After testing about five different recipes, the perfected version first went on sale last Saturday at 8 a.m. First in line was Robbie Brody and his 8-year-old daughter Eve. 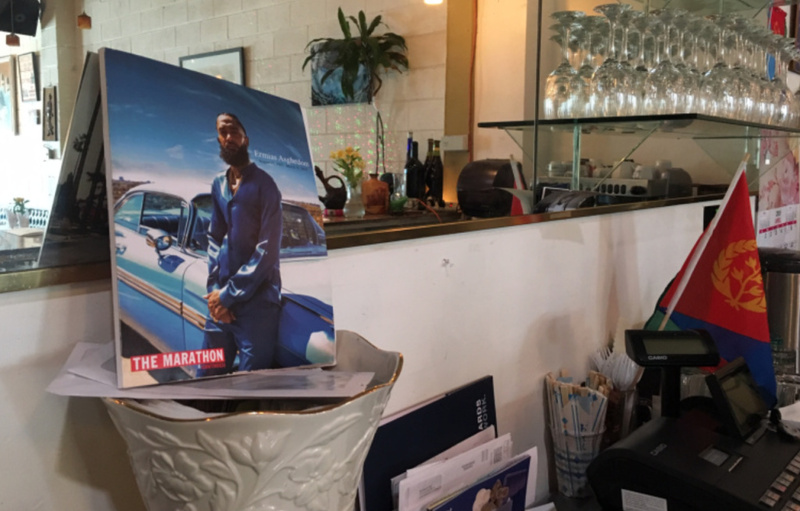 "We've been following the cronut story in New York," says Brody. 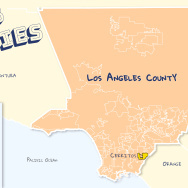 "So when we found out that there were going to be crullants here in LA, we wanted to be among the first. 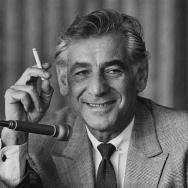 We didn't know we'd get to be the first." Eve says there's no way she'll be disappointed by the crullants. "I'm pretty sure it's not going to happen because we're the first ones here," she said. They were lucky because Semisweet Bakery can only make 48 crullants at a time. By 8:17 a.m. the bakery was all sold out. It was bad news for Sunny DeJesus, she was the next person in line at the time they were gone. "I thought I came early enough to get them, but unfortunately it looks like I have to wait," said DeJesus. But because she drove in from the San Fernando valley, she prepaid for two crullants and decided to wait an hour for them to bake. So do they live up to the hype? Robbie Brody said, "Oh, they're very flaky. They're very sticky, and yet the top is like you're eating cotton candy." His daughter Eve had a more simple review: "They're good." Semisweet Bakery is at 105 E 6th St in downtown, and crullants sell for $3.95 each. Have you tried a crullant? A cronut? Let us know what you think in the comments below.